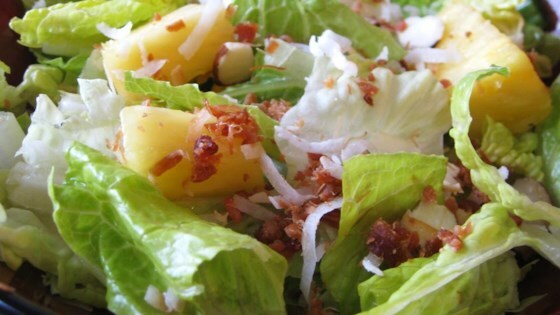 "An easy salad to make with a bag of salad greens, pineapple, bacon bits, nuts and toasted coconut. Use fresh pineapple, if you can, and substitute toasted almonds for the macadamia nuts, if desired." I added sugar to make it sweet and added raisins. At first I wasn't sure if anyone would like this different salad. However, it was a hit at a luau I attended. It's even better the next day! This is a great salad.I did'nt change a thing. Even my 3 year old nephew ate 3 servings of this.